Do you need to cover a guinea pig cage? Guinea pigs aren't jumpers or climbers. Hedgehogs, on the other hand, need higher Coroplast walls because they can and will climb. Generally speaking, you only need to cover a guinea pig cage that has high enough walls if you need to keep kids, cats or dogs out. High enough is about 12-14" tall. If you have males separated from females by a cage wall -- cover that area! You don't have to cover the whole cage, but put up a ceiling (like a "T") over the divider. Motivated males, especially younger, agile adolescents, can and will make the jump over a 14" grid wall to get to a female. And the last thing you want are any accidental pregnancies. In a C&C cage, you only need to cable-tie some grids across the top of the wall. If you have temporarily or permanently separated a pair of fighting males by dividing the cage, for the same reason as above with females -- hormones -- you'll also want to cover a common wall with grids as a motivated male can jump over the wall, especially adolescents. If you know you have an exceptional guinea pig athlete who would dominate the guinea pig olympics with medal-winning feats of high-jump (and we know they are out there), then you should get a cover. Just know those Piglympians are about .1% of the guinea pig population, so be happy you have a star! No matter what, you are responsible for your animals. If you are suspicious that you'd be better off with a cover for whatever reason, get a cover! If they are being attacked by a predator, hormones kick in and they may be able to scale the walls where they otherwise wouldn't. The one thing to take note of is that you or a young person chasing them around the cage trying to pick them up can be perceived as a threat as well. It wouldn't be difficult to chase them out of the cage if they had houses or something that they could jump up onto. This is partly why you should cover cages with young children in the home and only allow the guinea pigs to be picked up under supervision. 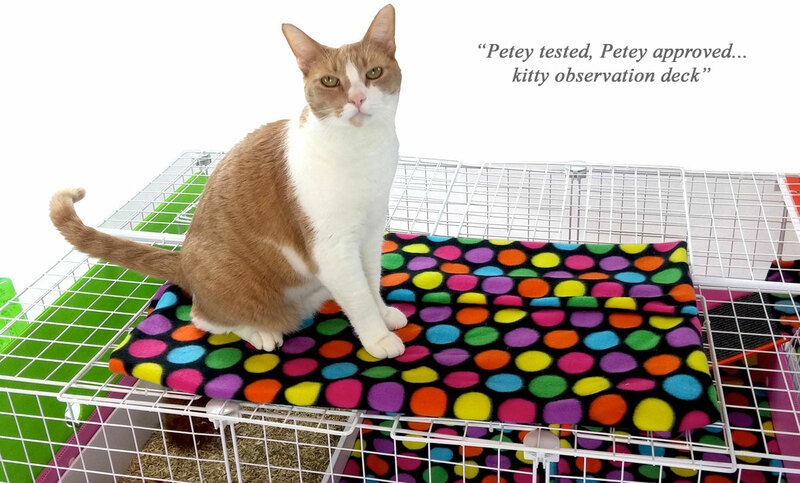 A cage cover must be strong and RIGID to support the weight of an animal or small person -- without caving in -- and provide quick and easy access. Don't find out too late that an unsupported screen or mesh top didn't hold. If you need a cover, you need a good cover! :) And don't underestimate the importance of quick, ease-of-use with your cover. Cleaning the cage and doing cage chores can become a drag over time. You don't want anything that is remotely discouraging in keeping you from getting in there and taking care of business -- refreshing, cleaning, adding hay, topping pellet bowls, feeding, etc. Keeping the cover super easy to flip up or push back into a variety of positions is important for chore motivation. And of course, we designed Cagetopia's Flip-Fold Cage Covers with you in mind. Safe for the piggies, easy for you! Depending on the size and configuration of your cage, we use combinations our Wonder Bars and our Cagetopia Cage Rods for support and hinging. We have those two items custom manufactured for us and they are top-quality, strong, powder-coated steel supports that fit C&C cages perfectly. They are safe, attractive and can be used for a variety of purposes. We think of a needing a cover for keeping them safe. Full cage covers, if they are open enough for proper ventilation and light, then they still aren't really providing that sense of security your guinea pigs desire. They want to feel safe from overhead birds of prey. They only feel safe under cover. Yes, a covered hidey will provide some sense of security, but they should have more than that available to them. In any C&C cage, we consider a 1x2 grid section to be a good coverage area to provide. And then scattered hideys based on the size of the cage and number of guinea pigs. It's preferable to create a 1x2 grid area of contiguous covered space, but if not, it's still acceptable if the space is broken up. And then, if you can't figure out how to give them some overhead cover, provide ample covered hideys instead. Larger cages, XL (2x5 grids) & up can afford to add additional covered area if desired. What is a hidey? Something covered that they can get into or be underneath with some perceived walls or surround. 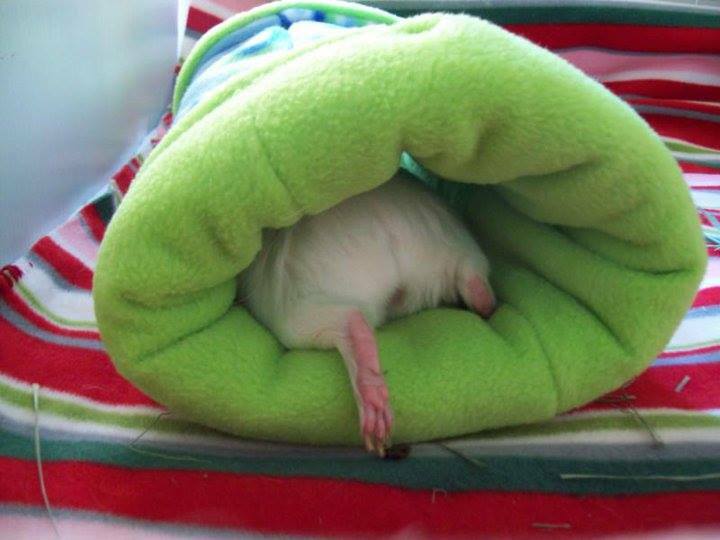 An open cozy isn't a hidey. 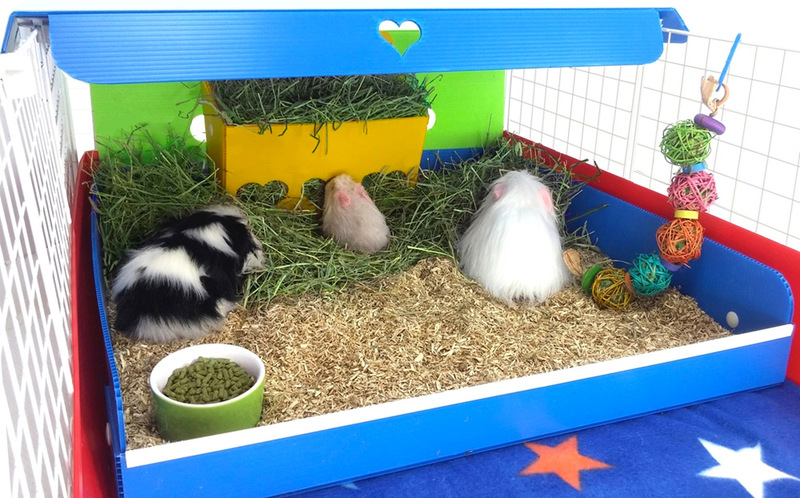 The most common pet store hidey is the PigLoo -- that plastic igloo looking roundish hidey. Many types of fleece and plastic hideys can work. Our flagship hidey is our Hidey Hut. It's a classic, high-quality favorite -- a soft and washable version of the plastic igloo with a reversible potty pad. Suggested number of HIDEYS in your CAGE = P+1 where P equals the number of Guinea Pigs. If you have 3 guinea pigs, you need 4 hideys (minimum) in your cage. Your cage needs to be big enough for the guinea pigs and the hideys. :) Additional hideys are okay if you have room without crowding out their run-around and zoomie space. Not everyone agrees. Some people prefer to withhold hideys as a way to 'break' the guinea pigs' instinctive need for cover. Even if that is your strategy, you should still provide the suggested 1x2 grid area ceiling coverage. Would you want to live in a stark, open environment? No animal does, really. The ideal setup is for the cover to go over a kitchen area which helps encourage them to use it as a litter box. The Cavy Canopy on the Guinea Pig Cages Store easily flips up or lifts off out of the way. But it is NOT compatible with a covered cage. 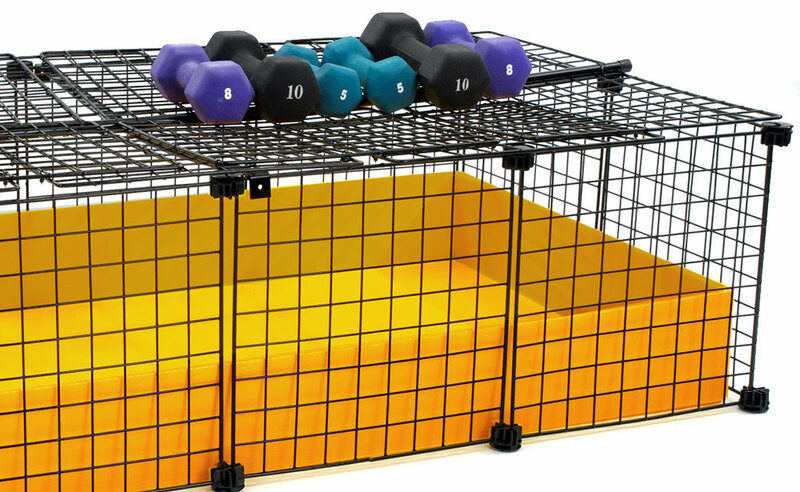 See the next solutions for a covered cage. 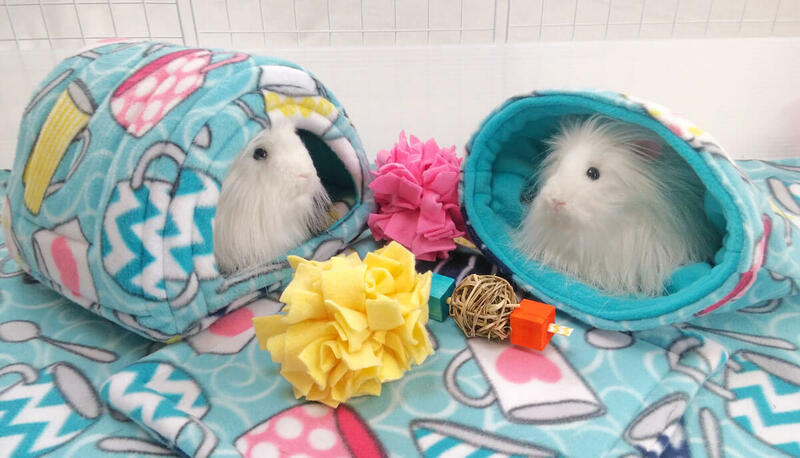 The Picnic Awning on the Guinea Pig Market option works WITH a covered cage as it's hooked on with lanyard clips so you can adjust the height. 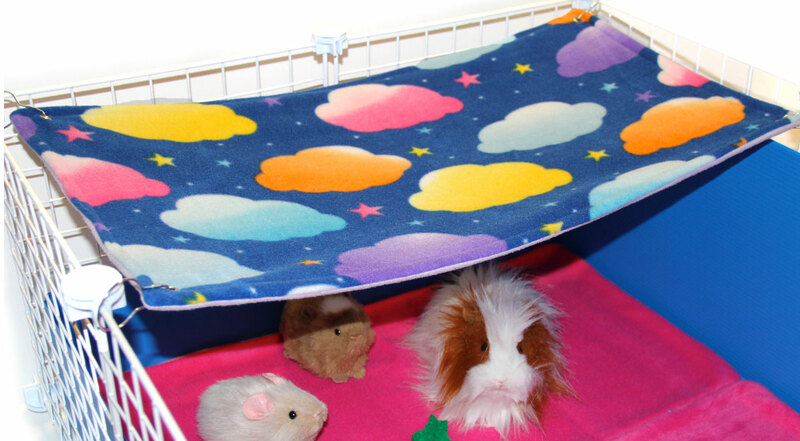 You can set it even lower than normal and have it be a lower ceiling and a hammock for a more adventurous guinea pig. Fleece Flipper Cases are a great item to use as a cover over one end of the cage. Just use binder clips to secure the corners. This option works WITH a covered cage as it's hooked on with binder clips so you can adjust the height. They are the perfect size and will match your decor. Flip over when you want to see the other side. If you have a covered cage, you'll need to mount the Fleece Forest in a corner but below the top, cover level. You just cable-tie it a bit lower. Drape a fabric over one end of the cage. Try not to cover the walls as you want as much air flow as a possible around the kitchen area.